“A modernist burner with an abundance of Pat Martino-style chops, Bailey sails up and down the fretboard with fluid abandon.” (Bill Milkowksi, JazzTimes Magazine) is rated among the foremost bopbased guitarists to have emerged in the 1990’s. She is also in demand as an educator. 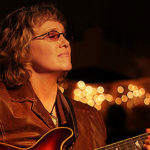 Sheryl has been an Assistant Professor of Guitar at the esteemed Berklee College of Music since 2000, and has been a popular clinician at the National Guitar Summer workshop, The Stanford Jazz Workshop, The Duquesne Jazz Guitar Seminar, Uarts in Philadelphia, and at Southern Cross University in Lismore, Australia.